The winner of our British & Irish Lions Competition 2013 has been chosen as Sarah Love from Bryntirion Comprehensive School. We had over 100 entries for the competition and judging was very tough. 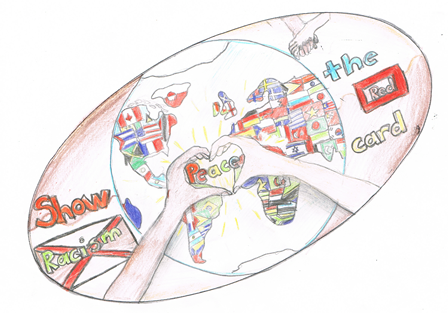 There were many creative entries encompassing the Lions regional nations with an anti racism theme. Campaign worker Jason Webber said" We wanted to set up a competition around the Lions tour and to highlight a anti racism message. The response we had was fantastic with some very interested and well thought out entries. Congratulations to Sarah." Sarah will be watching the Welsh Rugby squad during a private training session during their autumn international games.